I still haven't reached my piano techer, though... I tried to call her both yesterday and today but she didn't answer her phone. I hope I'll be able to start going to piano lessons soon since it's almost a month since I went to one the last time. Also, I haven't even been playing for a few weeks now, so this morning I notivec I had actually gone pretty much backwards... But well, now that I know where and when I can play, I may play more often. 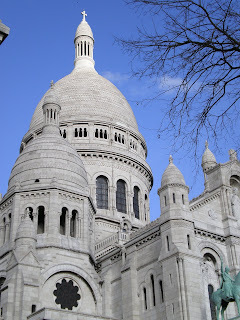 Here's Sacré-Coeur, perhaps one of my favourite buildings in Paris... This church is just so beautiful. 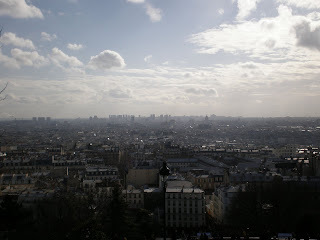 And this is the view over Paris from Montmartre. I think I live somewhere pretty much in the middle of the picture. 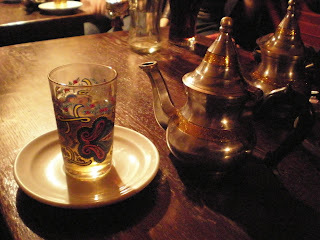 In the evening, I also met some of the other exchange-students and we went to spend the evening in a shishabar near Panthéon (although I first thought we were going to a sushibar! *lol*). Even though my french skills still are much worse than the others', I think it went better this time. I actually formed some real sentences and had a conversation with another girl! Goodie good! But I think I really have to start reading french book because my vocabulary is still not as wide as it should be. It's really hard to find the right words or even synonymes to explain what you really want to say. It's very annoying. Oh, and I by the way think Snufkin is protesting agains Paris and France. Not only did I lose my Snufkin pin, but now my Snufkin that I have on my mobile phone also broke! Unbelievable!